Day 1 of 6: Paul Tripp shares in six short videos wise insights on mission in marriage and family. My friend Lan Leavell introduced me to the writings and ministry of Paul Tripp. Lan introduced me to a lot of books and authors, for he is the avidest of avid readers I know. But his introduction to Tripp is quiet meaningful, for his writings and videos have encouraged and challenged me significantly. This week I am sharing them with you. What is unique about marriage that makes it a forum for ministry? Check out this free guide full of great resources on Being a Missional Family from the Verge Network. Grateful for Stew and the gang with Verge for providing such awesome resources for moms and dads and church leaders. What does it look like to build a marriage, raise children and build a family around Jesus, the gospel and mission? 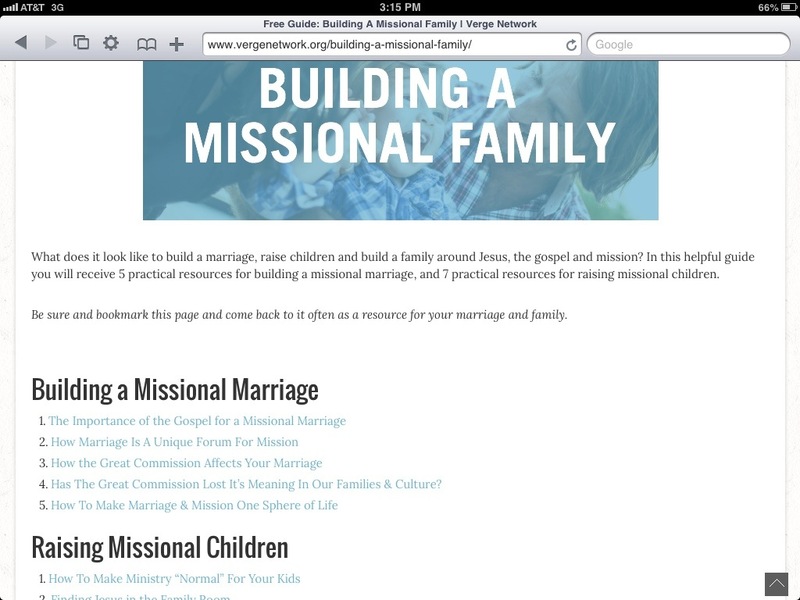 In this helpful guide you will receive 5 practical resources for building a missional marriage, and 7 practical resources for raising missional children.